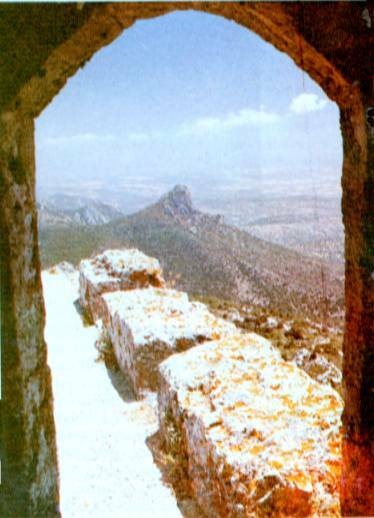 The Castle of Kantara is the eastern of the three Castles built on Pendathaktilos Mountain range. Built at a height of 2068 ft. 1t commands both the Northern Coast and the plain of Messaoria and controls the entrance to the Karpasia Peninsula. Kantara Castle like the Castles of St. Hilarian and Buffavento was first built by the Byzantines, probably after the complete deliverance of Cyprus in 965 A.D. from the Arab danger. However, nothing is known about the Castle before the conquest of Cyprus by king Richard the Lionheart in 1191. We hear about the Castle for the first time in 1191. Isaac Comnenos who declared himself as king of Cyprus took refuge here after his defeat by the English king Richard the Lionheart at Tremetoushia. After the Kyrenia Castle had surrendered to Guy de Lusignan, where Isaacs wife and daughter were captured, Isaac left Κantara and surrendered himself to the English King. 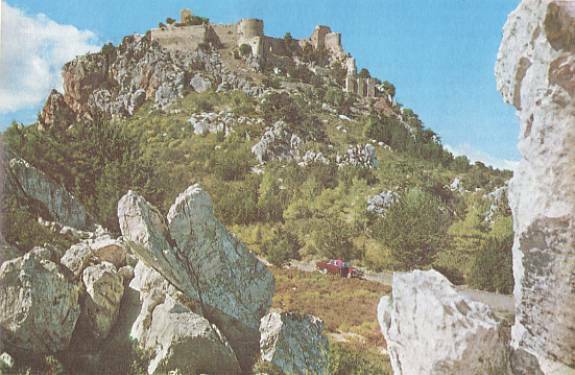 We have more information about Kantara Castle from the Frankish, and Venitian period (1191-1571). Its natural strong position made it many times a battlefield mainly during the Longobarbic war, which was partly the result of disputes among the knights of the Frankish kingdom of the Island. Under the name of Le Candaire or Candare it always remained impregnable by its occasional besiegers. After the defeat of the Supporters of the German Emperor Frederick II in the battle of Nicosia on the 14 July 1229 by the faithful to king Henry I (1218-1243) under the leadership of Regent John d Ibelin, one of the four leaders of the progerman party Gauvain de Chenichy took refuge at Kantara Castle together with some af his supporters and entrenched himself there. The Regent then sent an Army under the Knight Anseau de Brie in order to take the Castle. The besieged who were almost unarmed managed to resist for many months, inspite of the destruction that the walls of the Castle had suffered by a special trebuchet built by Anseau de Brie. It was only after the death of Gauvain de Chenichy and the many hardships that the Guard surrendered in the Summer of 1230. Two years later in 1232 in the absence from Cyprus of the Regent John d Ibelin, the supporters of Emperor Frederick II headed by Sir Aimery Barlais occupied the Castle again. After the return of the Regent and the seizure of Famagusta, the Castle of Kantara surrendered to the Regent after a peace treaty carried out by Philip de Novare. Kantara Castle remained in the hands of the supporters of King Peter II (1369-1382) even after the invasion of Genoese and the conquest , and destruction of Nicosia and Famagusta in 1373. There, Prince John of Antioch took refuge when he managed to escape from Famagusta, where he had been imprisoned by Genoese, disguised as cook with the help of one of his cooks. Later on in 1391 King James I (1382-1398), an uncle and successor of Peter II fortified Kantara Castle according to Etienne Lusignan. It seems that the existing fortifications date since then. The Castle was an invaluable observation and defensive outpost as long as the Genoese held Famagusta. After the conquest of Famagusta by James II or probably after the conquest of Cyprus by the Venitians a contingent of Italians from the Garrison of Famagusta was detached to guard Kantara Castle. The importance of the Castle, for the defence of the area from outside invasions, was pointed out in his report by Bartholomeo Kontarini (1519). At that time the Castle was in a very bad state because of shortage of guards and, because it was situated only two miles from the coast, could easily be conquered by three light enemy ships. Kontarini considered that the Castle was very important and suggested that men from the neighbouring villages should be, sent there as guards, being exempted from other services. He himself believed that once the Castle fell in enemy hands it would be difficult to be recaptured. in 1529 Silvestro Minio refers to it as a fortified and very strong place. A few years later, however, in 1562 we are informed by Sagredo that the Castle was in ruins. 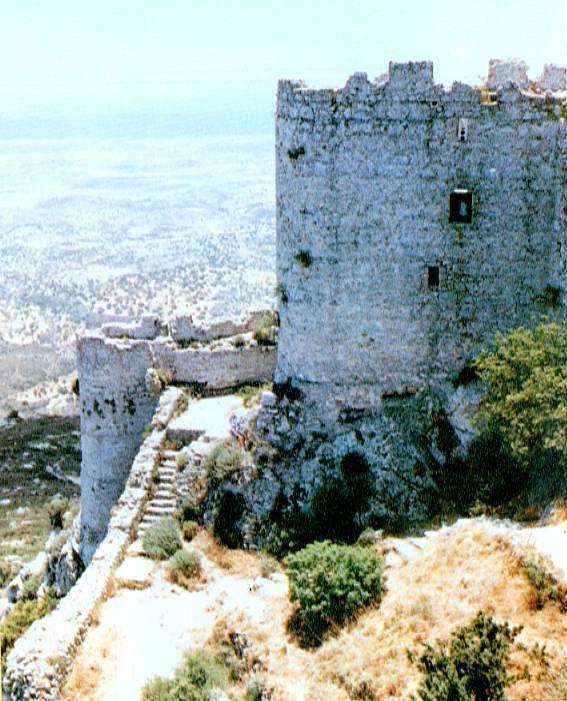 Etienne Lusignan writes that the three Castles of the Northern Mountain range Kantara, Buffavento aad St. Hilarion were dismantled by the Venitians who did not consider them important fortifications and could not defend them because of lack of soldiers. Nevertheless the demolition was not complete but the weather conditions facilitated the ultimate destruction. The rocky hilltop on which the Castle was built determined not only the outer contour but also the arrangement of the constructions. From north, west, and South the steep cliffs did not favour the approach and made the access to it impossible. So the Castle is entered from the east where the cliff is less steep and allows an access. The Castle is entered through an imposing barbican which is protected by strong towers. This barbican and the outer entrance are ruined. The entrance is about in the centre of the eastern outer wall and was protected on both sides by two rectangular towers of which only the lower parts survives. In the south tower are now arranged the latrines. The outer wall ended to the north and the south in two shoe-horse shaped towers with loopholes. Climbing the steps, the visitor having entered the barbican reaches the inner entrance of the Castle which is in the centre of a strong wall which ends in two huge towers at the North and South. The visitor entering the inner entrance and turning to the left comes to the S.E. tower, a large rectangular room covered with a cross vault. The vaulted basement of this room, which has now been turned into a cistern for rain water storage,was at first used as a prison. Leaving this tower the visitor comes to a vaulted room) which is now used as the Custodians Office. From, here the visitor following the path that leads to the South comes to a range, of three vaulted chambers with loopholes which were used as an abode for the soldiers. At the southest end of this range of these chambers is the Medieval latrine which was flushed by the conduit which drained the area enclosed by these building. Following, the path to the southwest the visitor sees on the left the remains of the south wall of the Castle and on the right a shoe-horse shaped cistern. Further to the west the visitor sees on the left the remains of a tower and on the right the ruins of other chambers and cisterns. The west part of ths southern wall of the Castle ends in a shoe-horse, shaped tower and continues at the west of the cliff with three vaulted chambers . In the most southernly chamber there is a small gate which was used by the garrison in an emergency. In the Northern side of the west part of the castle the visitor comes across another two vaulted chambers which were used as cisterns. Leaving this part the visitor and following the steep path sees on his left remains of the Byzantine Northern wall of the Castle with cisterns and other chambers which are now completely ruined. From here the view of the Northern Coast of Cyprus is majestic. The steep rocks of the Northern side of the Castle with their wild beauty end in a range of hillocks with smooth lines that go as far as the shore. Leaving the Northern wall of the Castle that embraces the steep cliff, the visitor may visit the chamber on the top of which the south wall with its beautiful window stands almost intact. 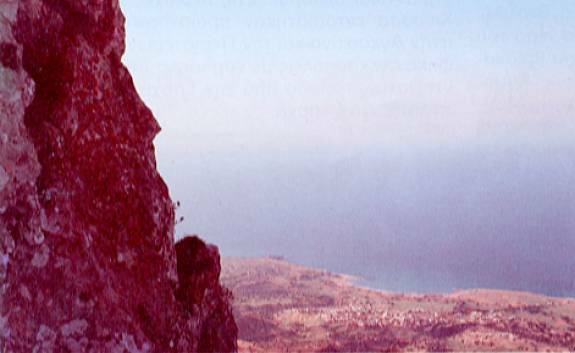 From this height 2068 ft. above the sea-level the visitor sees the Northern Coast of Cyprus all green with forests and olive groves, the Peninsula of Karpasia and the Eastern Messaoria as well as the Famagusta bay. The sight is unique and enchanting. The Medieval Guard of the Castle however, used this tower not in order to enjoy the view but in order to exchange messages with the guard on Buffavento Castle. Descending the Tower of the Summit and following the path with Northeast direction the visitor arrives at the Northeast two-storeyed tower which commands the entrance and controls the movements in the North Sea. The ground floor of this tower consists of a passage with loopholes at the North which leads to a square chamber covered with a cross vault. An entrance in the Eastern Wall of this chamber leads to the shoe-horse shaped vaulted tower with loopholes in all its three sides. The top floor of this tower consisted of a long narrow passage which ended in a rectangular chamber. From here a gate led to the roof of the tower which was surrounded with a parapet with loopholes. Leaving this tower the visitor following the path on his left, comes to the inner entrance of the Castle. The text above was taken from the Kantara Castle Visitor's Guide published by the Antiguities Department of the Republic of Cyprus.